Friends Kya Aap Janna Chahte Hai Apke Low Wale Android Mobile Ki Internal Memory Kaise Badhaye Jaye, Matlab Phone Memory Kaise Badhaye Without PC, Ya Phir Internal Memory Kaise Khali Kare, And Mobile Ki Internal Storage Kaise Badhaye Iske Ke Bare Me Janna Chahte Hai, Toh Aap Sahi Jagah Par Aaye Hai, Kyu Ki Is Post Se Apko In Sare Swalo Ki Jawab Details Se Mil Jayenge. Matlab Apko Kahi War Jane Ki Jarurat Nahi Padega. Dosto Kya Hai Ki Pehle Wale Set Sab Me Bhut Kam Internal Memory Deta Tha, Or Internal Memory Kam Hone Ki Wajahse Ham Koy Acche Ya Phir High Quality Wale Mobile Games, Apps (Software) Ko Mobile Me Install Nhi Kar Pate, Our Agar Install Bhi Ho Gaye, Toh Mobile Hang Marna Start Kar Deti Hai. So Agar Aap In Sare Problems Ko Face Kar Rahe Hai Or Problems Se Nikal Na Chahte Hai Toh Iss Post Ko End Tak Carefully Read Karte Rahe, Previews Article Mobile Ko Root Karne Ke Baad Kya Kare Us Post Me Bataya Tha Ke Root Karne Ke Baad Mobile Phone Ki Internal Memory Kaise Badhaye Iske Bare Me Ham Aage Janenge. Note: So Agar Aap Mobile Ko Root Kar Liye Hai Toh Aap Iss Post Ko Age Padhe Warna Pehle Mobile Ko Root Karle, Kyu Ki Is Article Me Apko Sirf Rooted Mobile Ki Internal Memory Kaise Badhaye Uski Jankari Milenge, Android Mobile Root Kya Hai Or Kaise Kare Uski Jankari Yaha Hai, Actually Ye PC Method Hai Agar Apke Pass Pc Nhi Hai Toh Root Kaise Kare Without PC Uski Puri Jankari Yaha Diye Gyae Hai, Or Mobile Successfully Root Hone Ke Baad Kya Karna Chahye Uske Liye Yaha Click kare. Kheer Yedi Aapke Mobile Rooted Hai Toh Chale Details Se Jante Hai, How To Increase Internal Memory On Rooted Mobile Without PC In Hindi. Friends Agar Apke Mobile Rooted Hai Toh Internal Memory Increase Karna Bhut Hi Easy Hai, Uske Liye Apko Sirf Ek App Ki Jaroorat Hai, So Niche Dye Gaye Steps Ko Carefully Follow Kare. 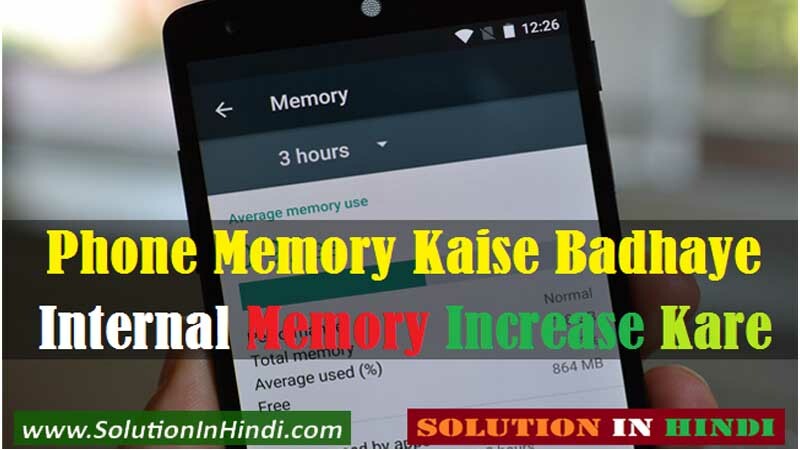 Step 1 Internal Memory Increase Karne Ke Liye Sabse Pehle Aap Link2SD Apps Download Kare. Step 2 Download Ho Gaye Hai Toh Link2SD App Ko Open Karo. Step 3 Open Karte Hi Mobile Me Jitne Bhi Apps Install Hai Woh Apke Samne Show Hoga. Step 4 Ab Apko Find Karna Hai Us Apps Ko Jo Jiyada MB Leke Rakha Hai, Like Agar Apke Mobile Me HD Games Install Hai Ya Phir FB Browser Jaise High-Quality Apps. So Jiyada Space Leni Wali Apps Par Click Kare. Step 5 Now Thoda Scroll Down Kare, ” MOVE TO SD CARD ” Ka Option Show Hoga, Us Par Click Kare. Step 6 Ab Kuch Seconds Wait Kare, Thodi Der Baad Woh Apps Apke Mobile Ki Internal Memory Se External Memory Me Moved Ho Jayegi. Done! Itna Karne Se Apke Internal Memory Successfully Increase Ho Jayegi, But Agar Apko Auto Mood Me Lagana Hai Matlab Koy Apps Install Karne Ke Baad Automatically SD Card Me Moved Ho Jaye, Toh Ap Step Ko Follow Karte Rahe. Step 1 Auto SD Card Me Moved Karne Ke Liye Sabse Pehle Aap Link2SD App Ko Open Kare. Step 2 Ab Top Ke Right Side Me MENU Hai Click Kare, Phir “Settings” Me Enter Kare. Step 3 Now Thoda Scroll Down Karke “Install Location” Option Par Click Kare. Step 4 Ab Install Location Me Se Aap “External” Option Ko Select Kare. Done! Ab Jo Bhi Apps, Games Wagaira Install Karenge, Woh Sab Apke External Memory Me Automatically Sift Ho Jayegi. I Hope “Phone Memory Increase Karne Ka Tarika” Hindi Me Completly Jan Gaye Honge, So Agar Apko Kahi Kisi Step Me Samajh Me Na Aaye Toh Please Comment Box Me Jake Bataye Or Agar Apko Ye Post Helpful & Useful Laga Toh Apke Friends Ke Sath Jaroor Share Kare. And www.solutioninhindi.com Ke Sath Update Rahne Ke Liye Subscribe Karna Na Bhule.